2011 marks the bicentenary of Franz Liszt. Following in the footsteps of Mendelssohn, Chopin and Paganini, Liszt made a remarkable tour to Scotland as a young man, of which we will hear an entertaining account. Also, four people close to him had Scottish connections: the eminent conductor Hans von Bülow directed a season in Glasgow, and left a lasting mark on Scottish music-making in several visits; Liszt’s pupils Eugen d'Albert and Frederic Lamond were both born in Glasgow and became world famous piano virtuosi; and Liszt’s friend the composer Sir Alexander Mackenzie, born in Edinburgh, was important in musical education and, along with those of d’Albert, his works are being rediscovered. 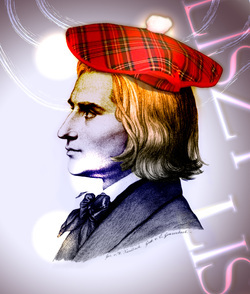 Derek Watson has gathered rare and interesting material about these Scottish connections, providing opportunities for musical and visual illustrations of Liszt's life and extraordinary influence. 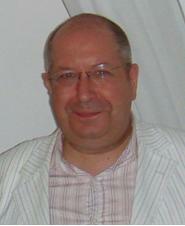 DEREK WATSON was born in Edinburgh and educated at the University of Edinburgh and the Royal Academy of Music, London. He studied composition with Kenneth Leighton, Edward Harper and Alan Bush. He is a freelance musician, pianist, composer and writer, living in the Scottish borders where he owns a village bookshop. The author of a biography of Richard Wagner (1978) and volumes on Bruckner (1975) and Liszt (1988) in the Master Musicians series, he has broadcast, lectured widely, and written many articles on music, especially on aspects of opera. At present he is writing a biography of Meyerbeer, some songs and orchestral music.